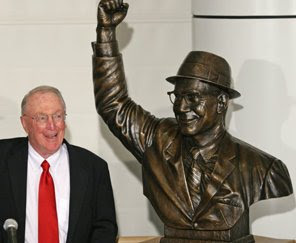 Coach Jack Kelley with his likeness (see photo from 1966 Beanpot) dedicated at Agganis Arena last Friday. A bio of Kelley, who is a member of the BU Athletics Hall of Fame, has been added to our list of Terrier Tales in the sidebar to the right. The first of two photo galleries from Friday's event has been posted on the GoTerriers.com Web site.